How Does It Work? Diffusion is the movement of molecules from a region of higher concentration to a region of lower concentration. Osmosis is a special case of diffusion in which the molecules are water and the concentration gradient occurs across a semi permeable membrane. The semi permeable membrane allows the passage of water, but not ions (e.g., Na+, Ca2+, Cl-) or larger molecules (e.g., glucose, urea, bacteria). Diffusion and osmosis are thermodynamically favorable and will continue until equilibrium is reached. Osmosis can be slowed, stopped, or even reversed if sufficient pressure is applied to the membrane from the ‘concentrated’ side of the membrane. 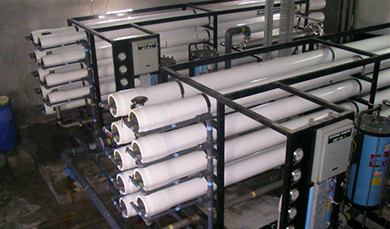 Reverse osmosis occurs when the water is moved across the membrane against the concentration gradient, from lower concentration to higher concentration. To illustrate, imagine a semi permeable membrane with fresh water on one side and a concentrated aqueous solution on the other side. If normal osmosis takes place, the fresh water will cross the membrane to dilute the concentrated solution. In reverse osmosis, pressure is exerted on the side with the concentrated solution to force the water molecules across the membrane to the fresh waterside. The EEC Desal Reverse Osmosis Desalinator’s utilizes the latest in reverse osmosis membrane technology to convert Seawater, Brackish water, or non-potable water into drinking water. 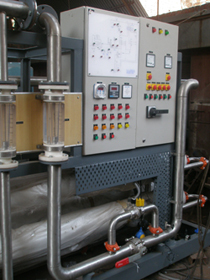 All plants are customized to clients specific need to secure reliable equipment and safe drinking water. EEC are ready to design any membrane combinations implementing RO, UF, NANO or Micro Filtration in various steps so to customize solutions to meet your exact requirements. Some General Consideration. Every seawater RO application is unique and very site specific. What may be the optimum solution for one plant will not necessarily be the optimum solution for other plant. Variables include salinity, temperature, pretreatment requirements and finished water quality. Some parameters, such as materials, will be constant. Seawater is, after all, seawater. Regardless of location, the predominant component of the seawater is sodium chloride, which experience has taught us requires materials that resist attack by the chloride ion. Pretreatment.Perhaps the most critical factor in the design of a successful seawater RO facility is acquisition and pretreatment of the source water. There are two techniques for acquiring the raw water, and for a variety of reasons, both are probably not applicable to all cas. Seawater, of course, is predominately a coastal phenomenon and as such occurs alongside beaches, mudflats, swamps, cliffs and other assorted geologic features. For large plants, surface water intake facilities are required. These are similar to intakes used for coastal power plant cooling water. Control of biological activity and fouling. Traditionally, seawater pretreatment has consisted of flocculation and coagulation with a ferric salt, sometimes applied in conjunction with a polymer, sedimentation and filtration. Depending upon the circumstances, a continuous chlorination and dechlorination procedure sometimes is employed. Intermittent chlorination and dechlorination is also practiced. 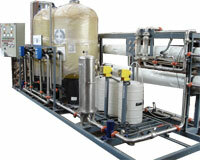 Filtration has typically been practiced as a two-stage process using dual or multi-media beds. Traditionally, the first filter operates at a relatively low loading rate of 3 to 5 gpm/ft2, while the polishing filter operates at a higher 5 to 7 gpm/ft2. When sizing the filtration equipment, capacity for the production of backwash water must be included.